Intertwined with the stream that flows from the waterfall is the arterial pathway around which the Combs Point Residence is organized. 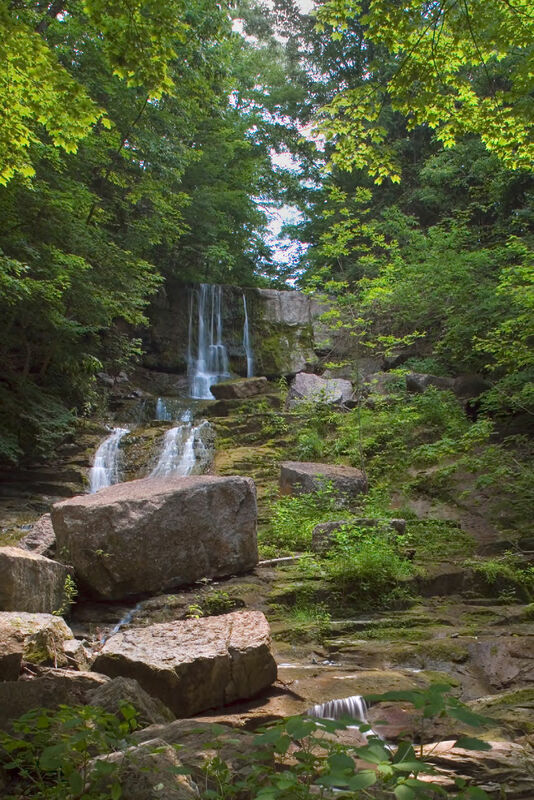 It exists as a mere footpath along the forested hill that leads up to the waterfall, but it turns into an elevated boardwalk in the lower half of the valley, sinuous and meandering like the streambed itself. The adjacent landscaping, which appears natural and untouched, actually required some fine tuning. 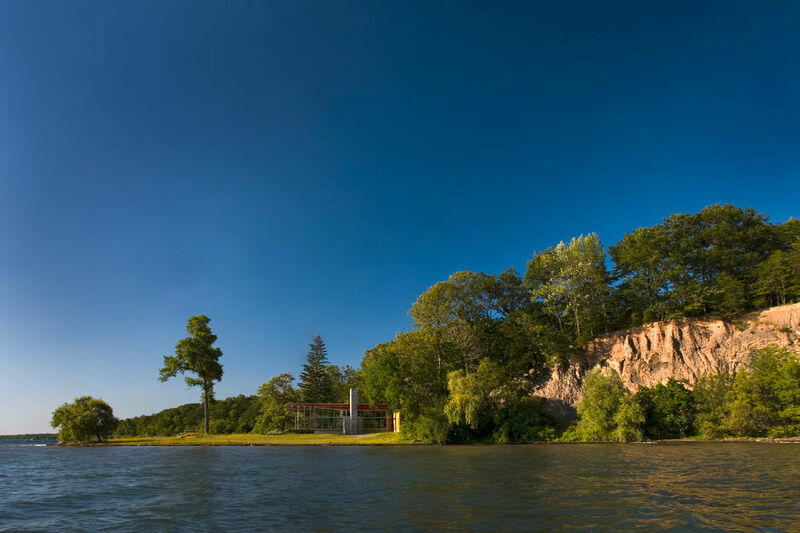 Bohlin Cywinski Jackson worked closely with a landscape firm to get rid of invasive plant species that had been introduced by previous inhabitants of the site and to reestablish native ones. Native plant material was also intentionally brought close to the boardwalk. 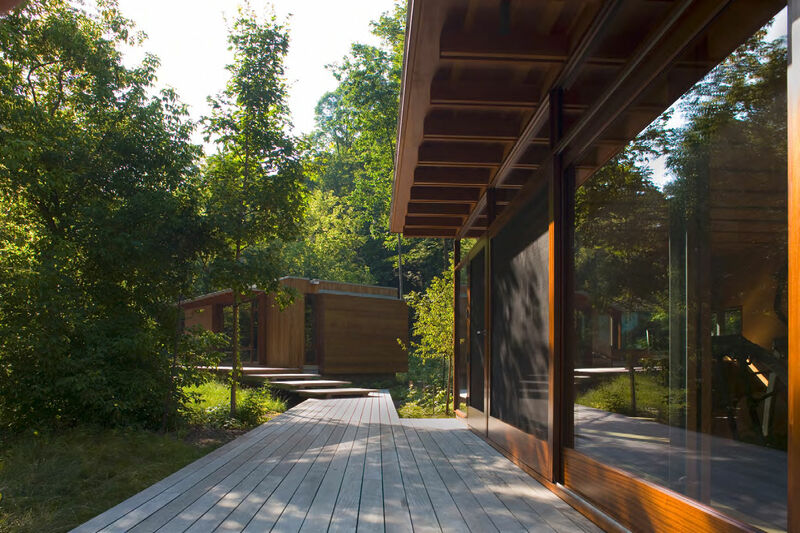 “Further up in the glen, the forest ground cover was brought out into the ravine, even below the walkway,” says Todd Howard, a Project Manager at Bohlin Cywinski Jackson. Foot traffic is the only kind of traffic that occurs in proximity to the house; a garage and boathouse are both on the opposite side of the stream from the dwelling. “The bridge is just big enough for an emergency vehicle,” says Howard, “and for everyday use, the owners take loads of groceries or garbage across in a Gator.” Typically, the panorama of the residence’s northern elevation is viewed from the vantage point of the bridge as visitors approach on foot. 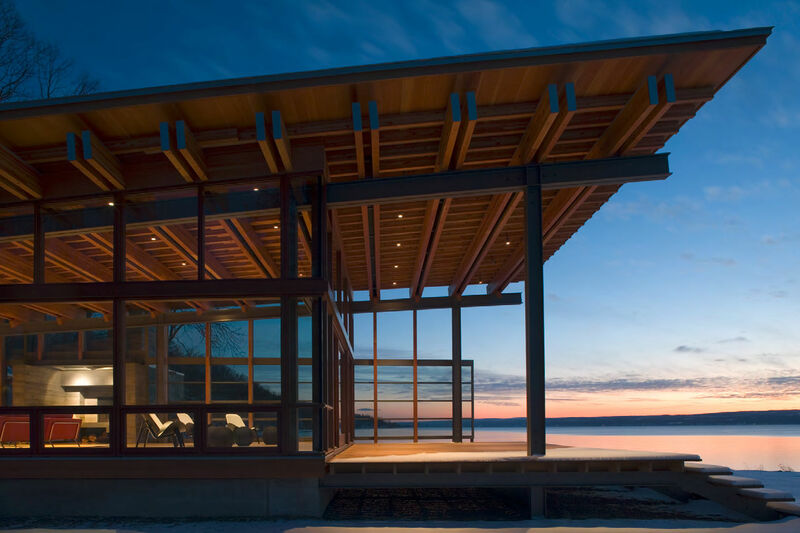 Attached to the boardwalk are the pavilions of the house. 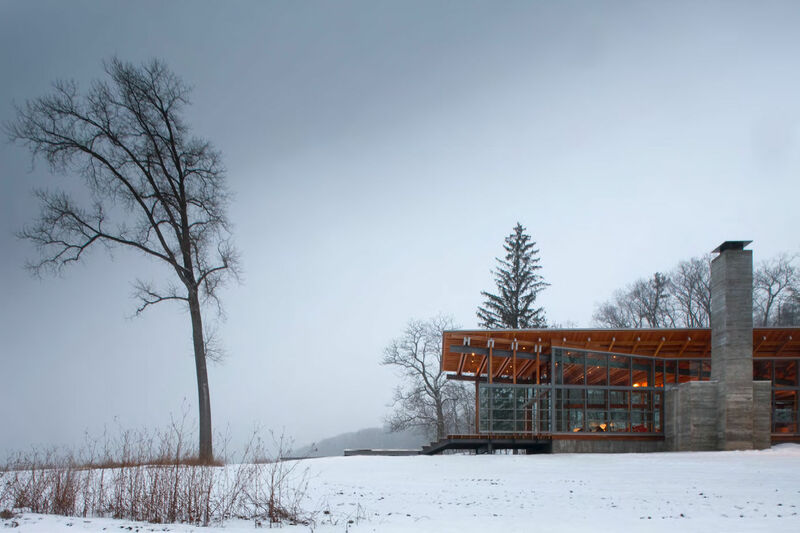 A trio of wood-clad forms with generous expanses of glass, they follow the grade up the hillside. 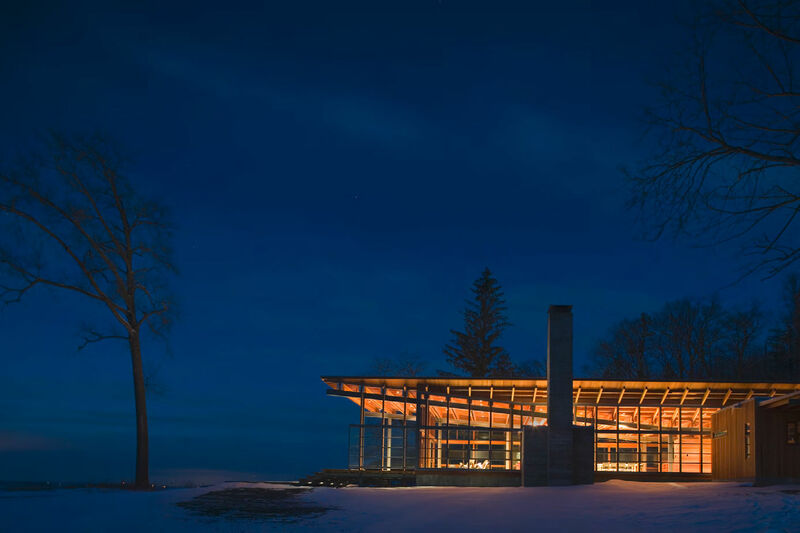 Bohlin explains that the decision to make three separate but connected structures came from the need to keep the house an appropriate scale. Uppermost in the valley is a two-bedroom, 1,400 sq. ft. (130 m2) guest house. 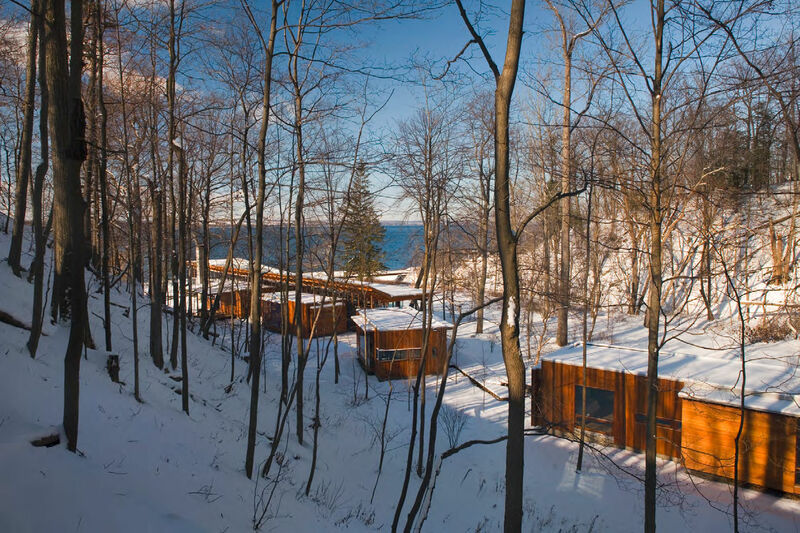 Howard says that the Combs Point Residence was designed for a family of four, but with two children, the owners anticipate needing room for an expanded family in the future. 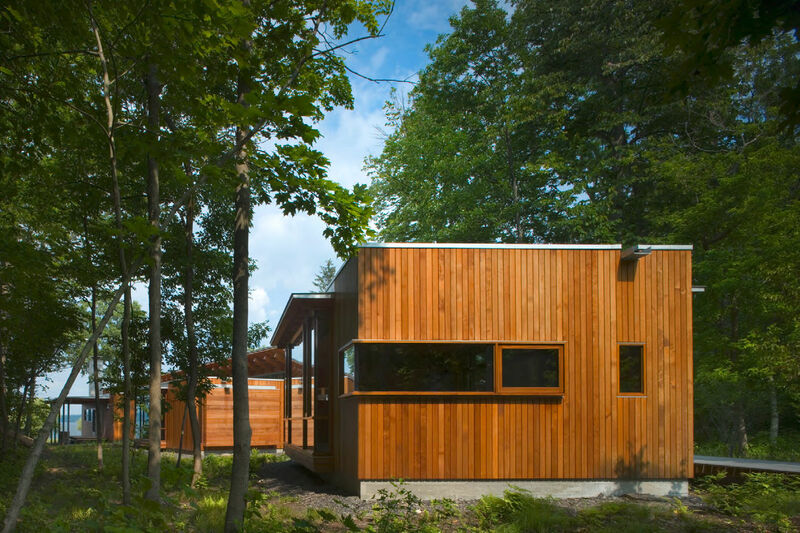 The simple, rectilinear form of the guesthouse is clad in cedar siding. Its planks are placed vertically, to contrast with the horizontality of the fenestration and of the building itself and “to add height,” says Howard. 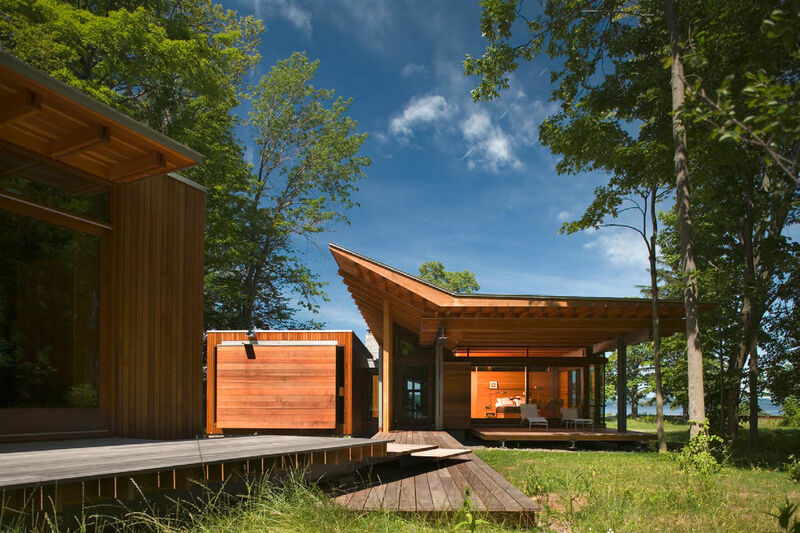 However, he points out that in all three of the buildings, where portions are extruded, the siding becomes horizontal in order to articulate the change in massing. 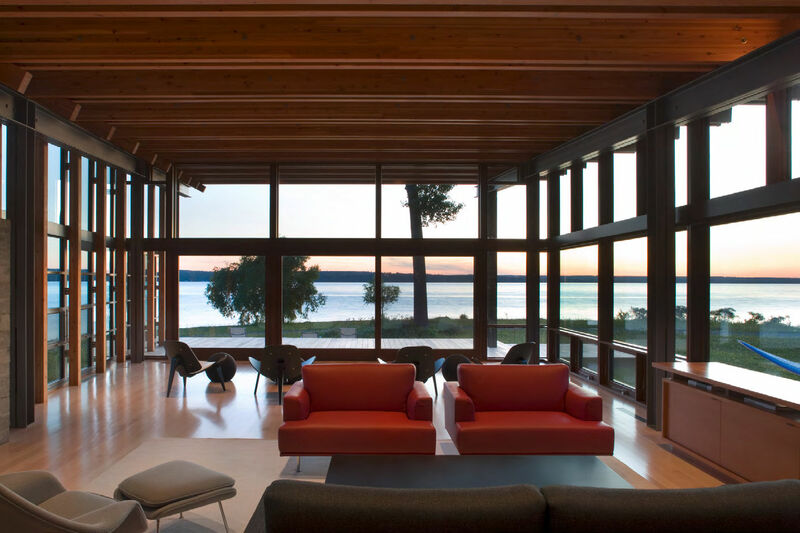 In the living room/kitchen area and on one wall of the western bedroom, floor-to-ceiling windows allow views out. Slightly downhill from the guesthouse is the smallest block of the composition, a single room that is used as an office and exercise area. 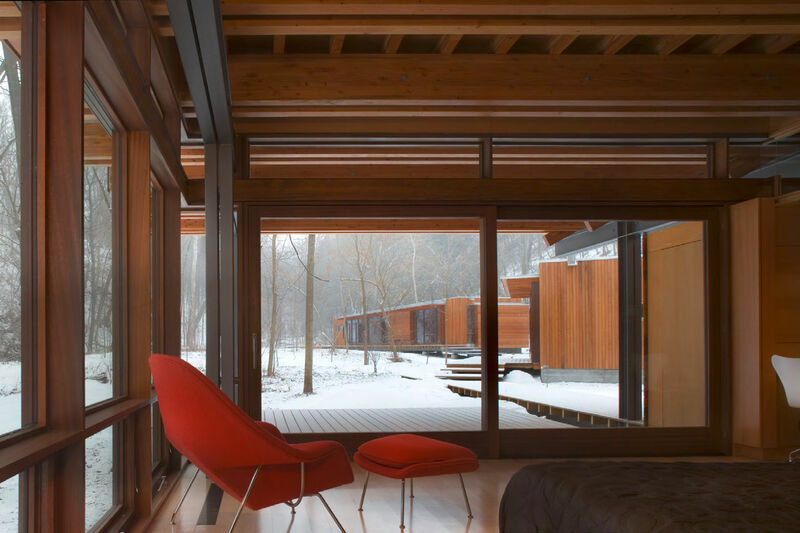 This room echoes the rectilinear form of the guesthouse and has the same floor-to-ceiling windows at its center. It pivots subtly away from its companion structures, however, as does the boardwalk adjoining it, to keep the overall flavor of the design organic as opposed to orthogonal. 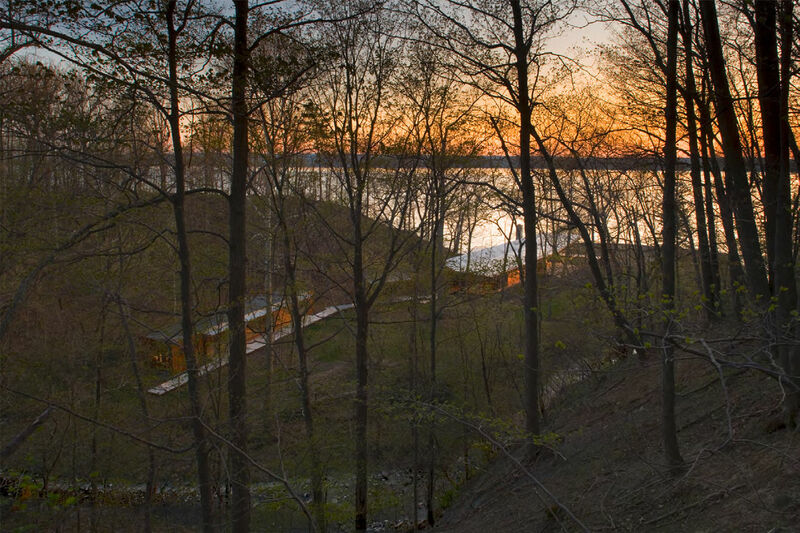 Paralleling the stream and its delta at the base of the hill, the 5,400 sq. 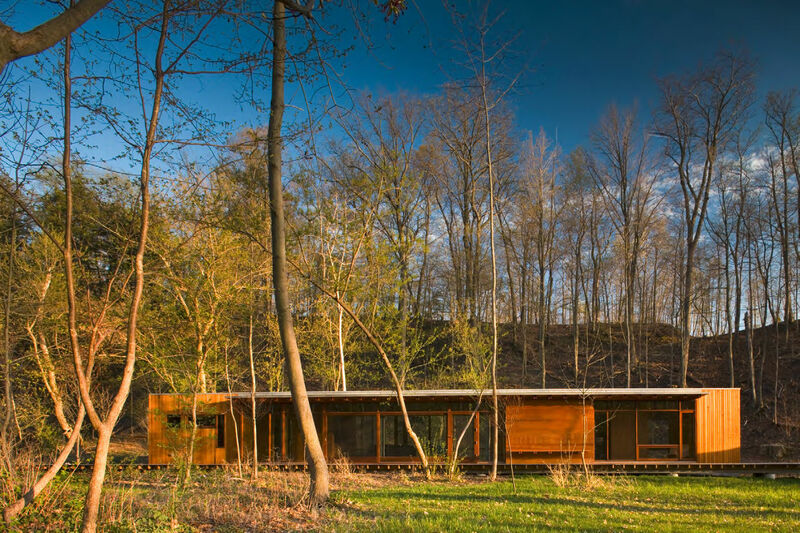 ft. (502 m2) main house emerges from the edge of the forest, opening itself toward the lake. Here angularity gives way to an exuberant flaring of the roofline. 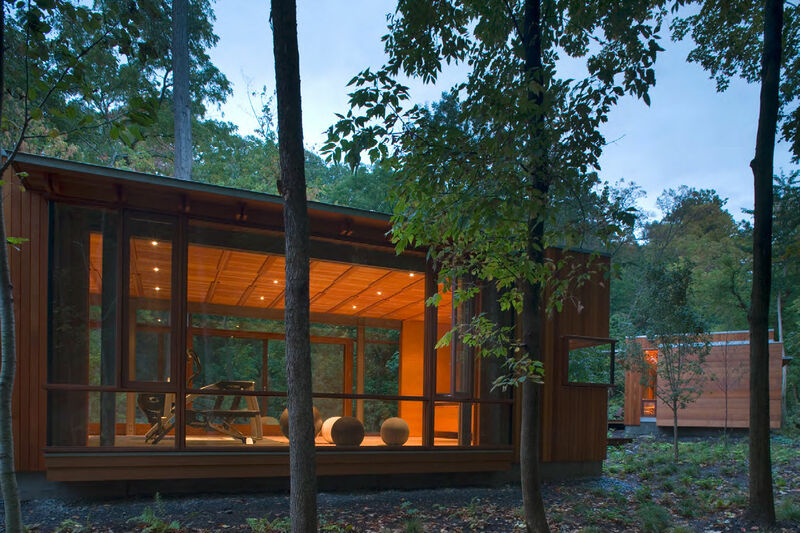 “The other two pavilions – which I call the saddlebags – are framed with smaller members, and there is wood between the frames to create a delicate look. The siding on those buildings is smaller,” says Bohlin. 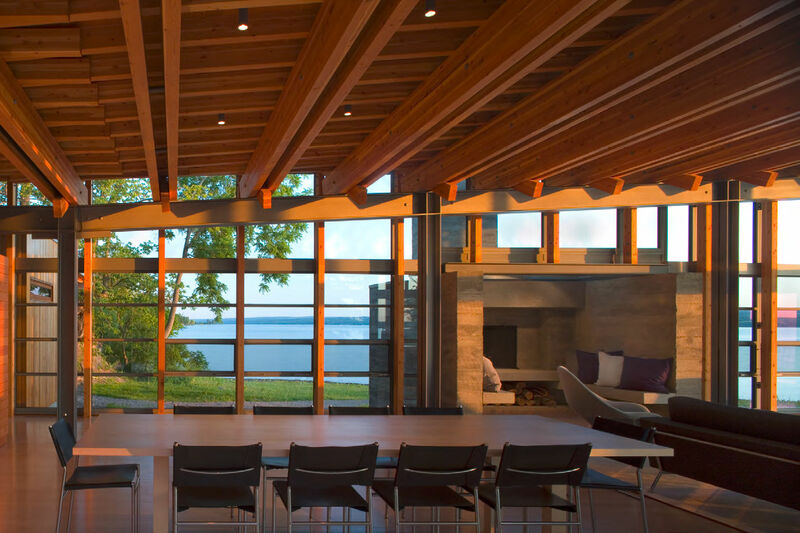 “But in the main house, there is a heavier expression: longer spans, heavier beams.” In part, this heavier framing is a practical choice, as this exposed portion of the site requires more wind protection. Part of the southern wall’s glazing extends outside to the porch, as well, providing a windbreak for this outside room. 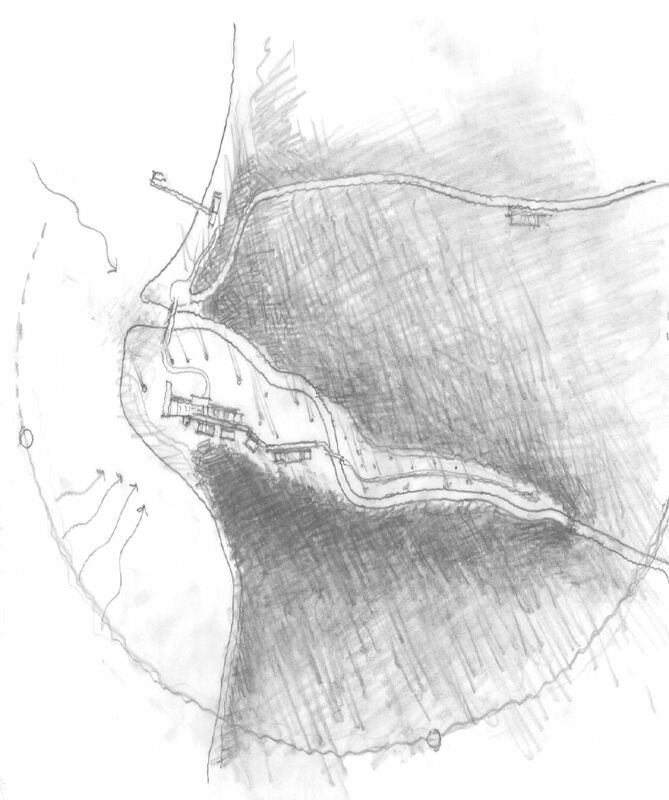 Conceptual site plan sketch showing the house as a series of pavilions stretching from a valley to a point on the lakeshore. 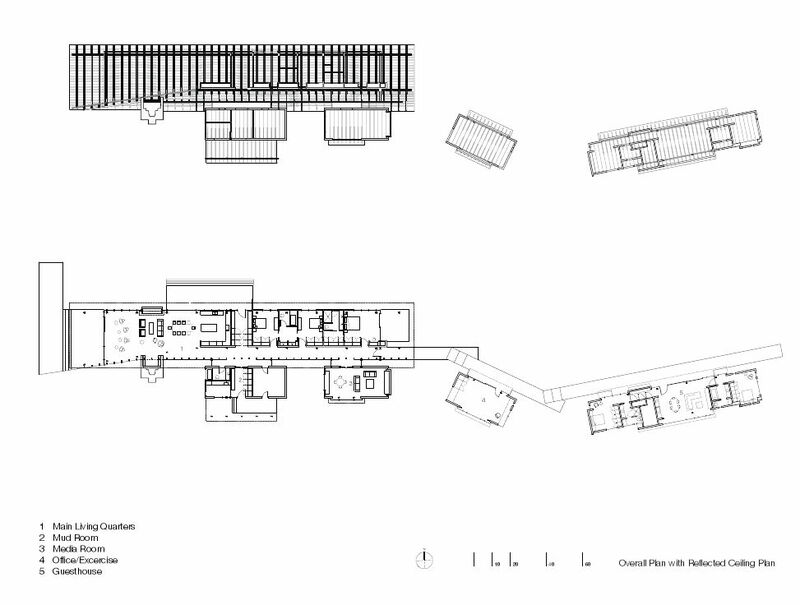 Overall plan with reflected ceiling plan. 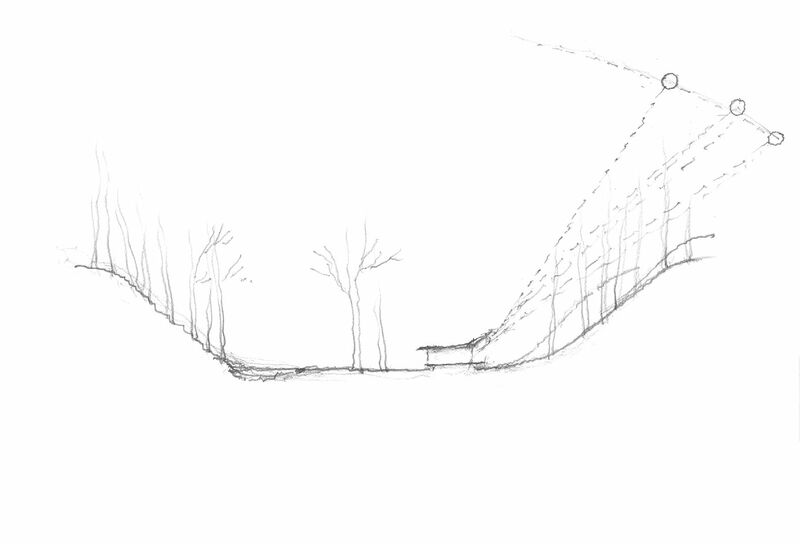 Conceptual site section showing how the roof of the main residence responds to the southern ridge and the solar path. 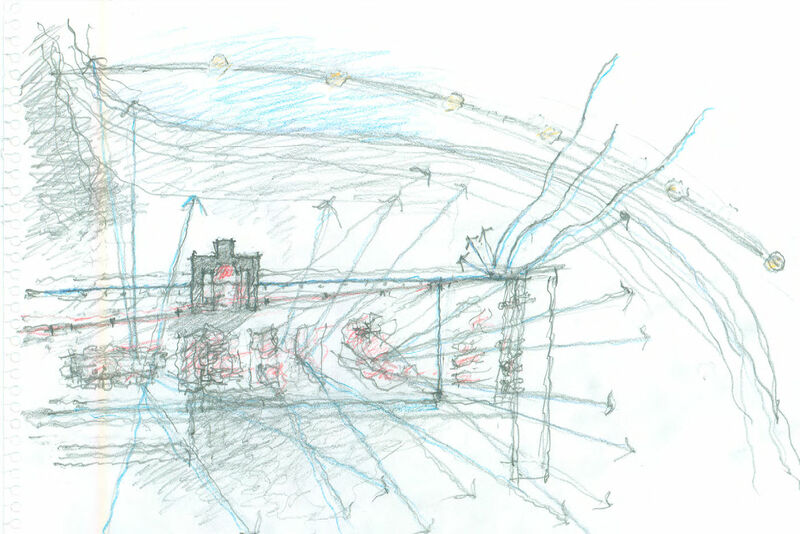 Conceptual sketch of the living room pavilion illustrating the solar orientation, views, and prevailing winds. The glass wall panels at the end of the living room slide open to extend the usable space into the outdoors. 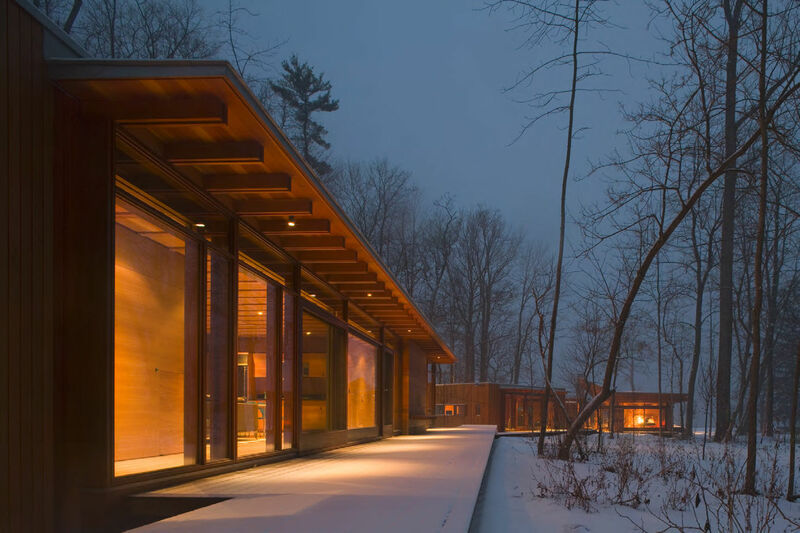 “But it’s a house for all seasons,” says Bohlin. Even in the winter when it’s sealed up, the room has a porch-like feel. An element that adds visual weight to the structure all year but which enhances its comfort especially in the winter is the large block that contains an inglenook and the fireplace. 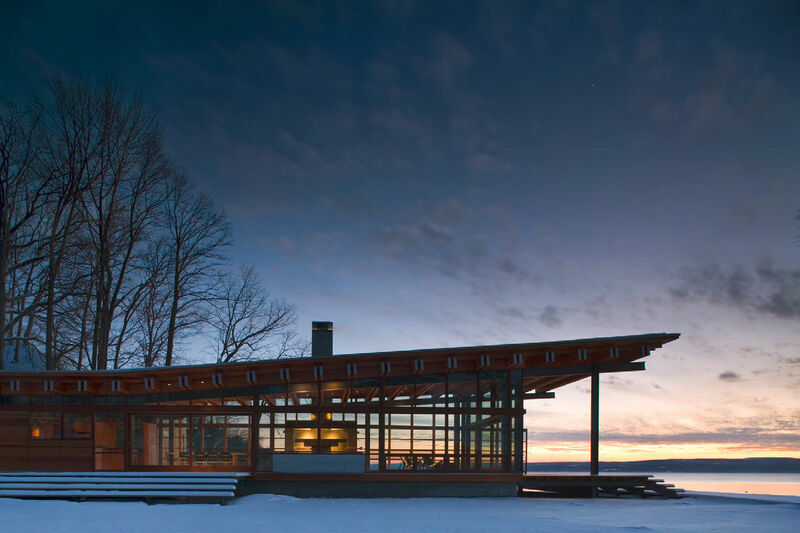 “A fireplace by itself is small,” says Bohlin, “but ever since I began designing houses – starting with my parents’ first house – I’ve been increasing the scale, making it a place, not a thing.” The Combs Point Residence fireplace cube is an extension of the building’s concrete foundations, making it integral to the rest of the building, and a skylight keeps with the theme of infusing the space with light. Outside, the squared tower of the chimney is appended to the fireplace cube; inside, the layering of volumes is reductive, with recesses for seating seemingly cut into the cube. “When I was young, I looked at so-called ‘primitive’ buildings with their hearths. 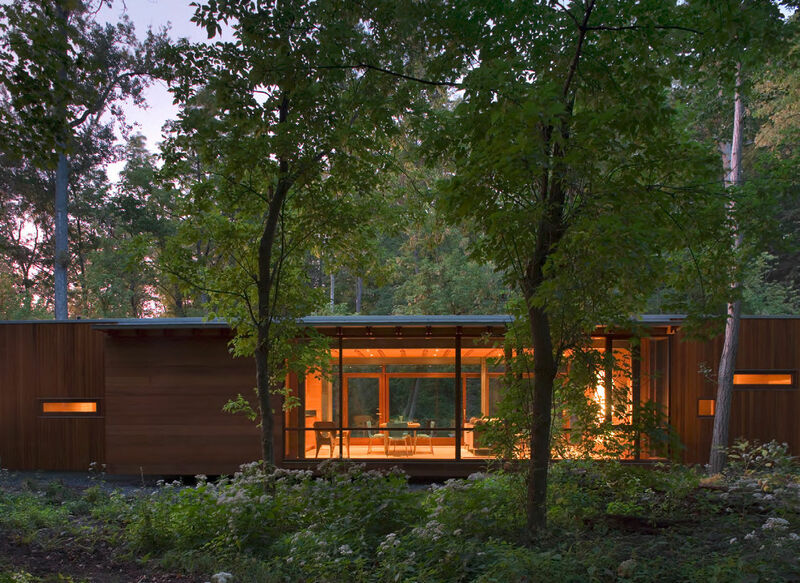 I would see how things are made and ask, ‘How do we do it now, with modernism?’" Bohlin explains. His modernism is, he says, more akin to that of Northern Europe than to Southern Europe. 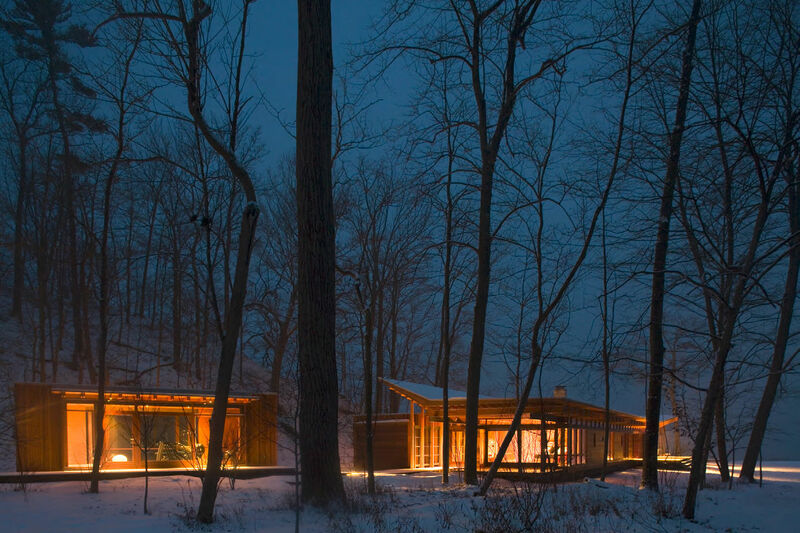 It is “more personal, softer … more humane.” He also likens his method of dealing with forms to that of Louis Kahn. 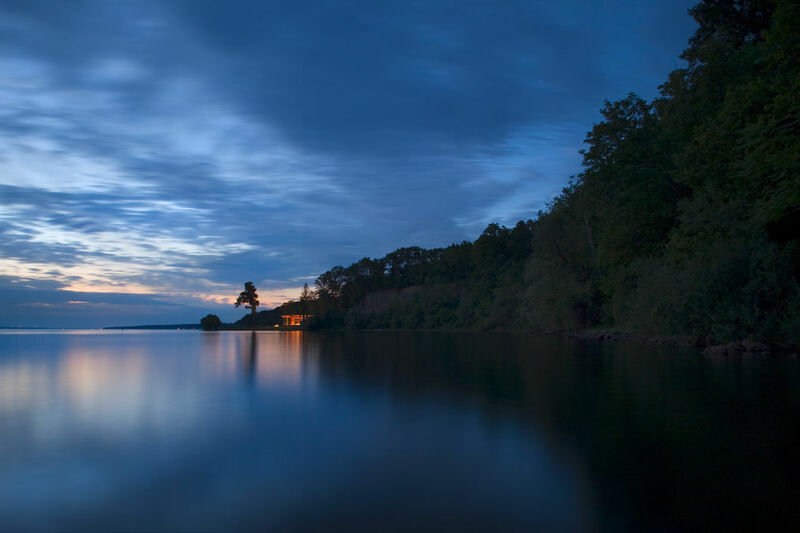 Further proving that the house is attuned to the practical side of things is the fact that it uses the lake as a source of geothermal heating and cooling. 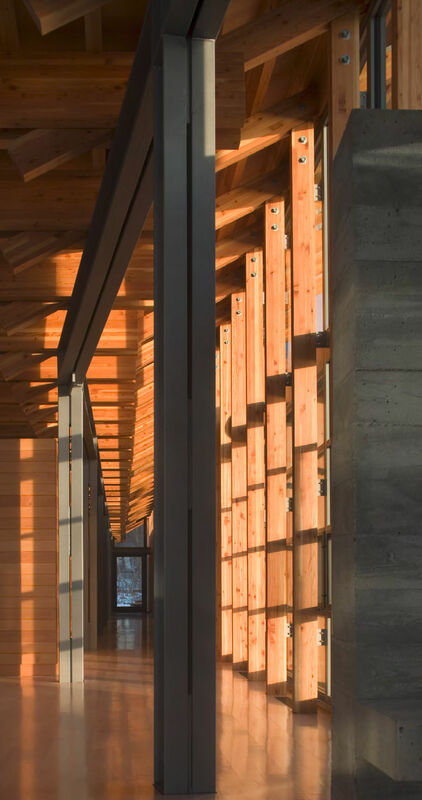 The light that pours into the structures allows for passive solar gain. During construction, the buildings’ Mennonite carpenters showed their experience in recycling waste materials, donating them to the local Habitat for Humanity.